(CNN) -- South Africa's Tim Clark and American pair Woody Austin and Steve Stricker share the first round lead with seven-under-par 63s after the first round of the Colonial tournament in Texas. 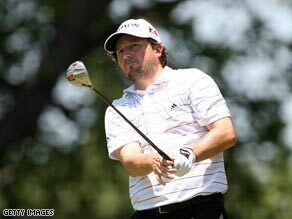 Tim Clark fired seven birdies on a superb opening round at the Colonial. There was also a remarkable performance from Australian Ian Baker-Finch, who won the tournament 20 years ago but retired to become a television commentator after a dramatic loss of form. His last tournament appearance came at the Colonial eight years ago when he shot 74-77 to miss the cut, but on his return the former British Open champion carded a fine two-under 68. Fiji's Vijay Singh and Ryder Cup star Kenny Perry are the nearest challengers to the leaders, one shot behind. Perry, who came close to winning the Masters this year, is chasing his third win at the Colonial. Singh has not played at the Colonial since withdrawing in 2003 in protest at the inclusion of Annika Sorenstam as a wild card. Australia's Jason Day carded a 65 with in-form British duo Ian Poulter and world number three Paul Casey part of a six-strong group on 66. Casey flew in to Texas after winning the PGA Championship on the European Tour to reach his best-ever world ranking. He has three wins already this season and eyeing a fourth in the $6.2 million tournament.